A good portion of the U.K. mass transit system, including National Rail, has been added to Apple Maps a week after the company added Salt Lake City in the U.S.
First spotted by MacRumors, the U.K. additions to metropolitan areas include Birmingham, Bristol, Cardiff, Glasgow, Leeds-Bradford, Liverpool, Manchester, Newcastle, and Sheffield. Other smaller localities in between the major locations have been added as well, with a large swath of the nation now covered with mass transit information. Adding to the deployment, the Transit information also includes data from the National Rail system, and most of the other associated services to allow for easy transit from one metropolitan area to another. In the U.S., Salt Lake City's transit information has been added as well. The addition of the area brings the total of U.S metropolitan areas mass transit systems supported by the app to 28. 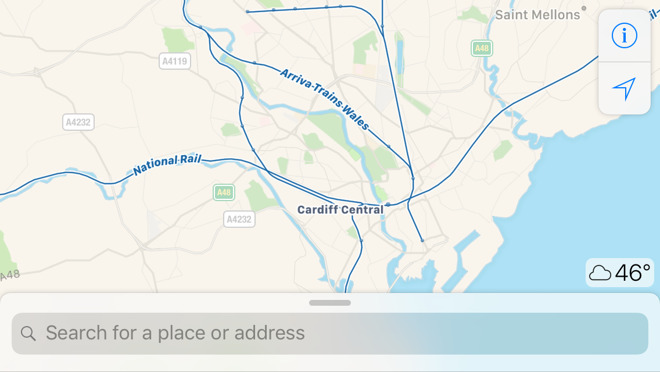 Apple's transit city launches differ from the rollout of Google Maps, which rapidly expanded transit directions to new cities with incomplete data, befuddling passengers. As it builds out its own support for mass transit, Apple is now working to avoid more of the criticism it received with the troubled original Apple Maps rollout with iOS 6, while also avoiding the inaccuracy and unreliability seen in Google's frequently raw and incomplete transit data.